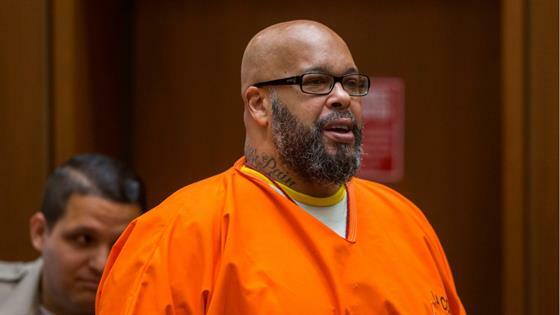 UPDATE: A Los Angeles judge sentenced Suge Knight to 28 years in state prison on Thursday, two weeks after the Death Row Records co-founder pleaded no contest to voluntary manslaughter for running over a man named Terry Carter with a pickup truck in 2015. Knight received the high-term of 11 years in prison for the voluntary manslaughter count that doubled because he has a prior conviction under California's three strikes law, and received an additional five years because the conviction was for a serious and violent felony and a year for the deadly weapon allegation, the Los Angeles District Attorney's Office said in a statement to E! News. According to the Los Angeles County District Attorney's Office, the music producer entered a plea for manslaughter by use of a deadly weapon, which was his truck. The incident, which Knight's attorney has referred to as a "tragic accident," occurred on the set of a commercial shoot with The Game, Ice Cube and Dr. Dre. It is reported that the Death Row Records founder was trying to leave after an altercation with a crew member, during which he ran over Terry Carter and Cle "Bone" Sloan. Carter succumbed to his injuries at a hospital later that day, while Sloan sustained minor injuries. Knight and his attorney have attempted to throw out the case, however, the District Attorney argued there was sufficient evidence to move forward the case. The case moved forward even after Sloan said he wasn't a "snitch" and didn't remember most of the events that occurred on the day of the hit-and-run. Dr. Dre was later dragged into the story when Carter's family filed a wrongful death lawsuit against Dr. Dre and Ice Cube, claiming the rappers were responsible for the person's death because they allowed Knight on the premises, despite knowing his criminal past. The case was later thrown out by a California appeals court.